Fake, false or fabricated news is deliberate misinformation to influence public opinion, drive an agenda or achieve some other purpose. The misinformation or hoaxes are normally spread via social media but also via traditional mainstream media. It is possible to spot fake news. 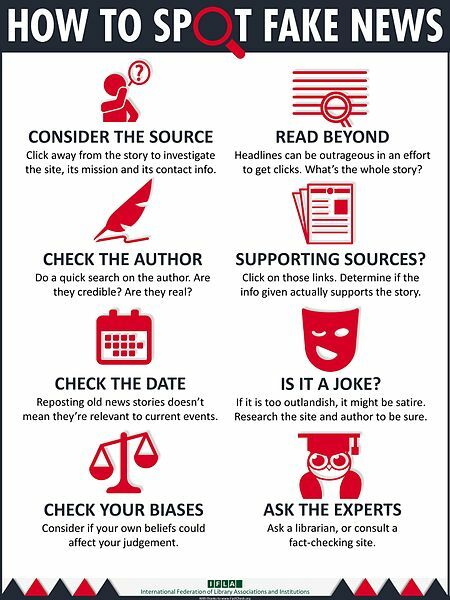 The following are a few ways to tell if a story is genuine. Look carefully at the source of the story. Who has published the story? Is it a respected individual or institution. Check their 'About Us' page and read their mission and check if they have published any contact information. Also, look at the URL carefully. Small changes in the URL can make a story appear to come from a reputable site, for example, a fake news creator could register a domain that closely resembles a genuine news website. False stories usually have catchy headlines that almost seem unbelievable. These are known as click bait, an unethical publishing practice of writing deliberately false headlines to encourage to click and read the story. Is the author of the story credible? Are they real? Do a quick search to find out. Also, like all forgeries, fake news created by amateurs will usually contain spelling mistakes and grammatical errors that a reputable organization will hardly make. These are a dead giveaway that a story is fabricated. Old stories are often regurgitated even when they are irrelevant to current events. Could your own belief system be clouding your judgment? Creators of fake news take advantage of people's biases, for example, stories that are racist or hate speech will often be accepted as gospel truth by persons who are already biased. Does the story have any supporting sources? If so, click on the links and see if the source information supports the story. Is there any other news source reporting the same story? If there isn't, then that could be an indication that the story is false. 7) Is it a Joke? Some stories are intentionally false. For example, on April fools day, many media organizations fool their readers with fabricated stories. If after all the above, you still aren't sure, ask a subject matter expert. 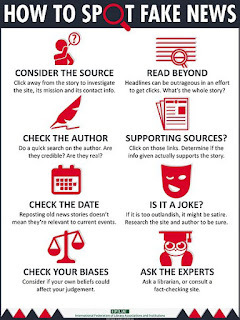 Alternatively, you can consult a fact checking website such as Infohub by sending us a comment below and we will get back to you with the truth.